Silca SPEED 046 Manually Operated Key Machine. Heavy Duty. Manual Key Cutting Machine. This machine is used for cutting safe deposit box and flat steel keys only. The Speed 046 provides an economical and accurate manual cutting solution for flat type keys (Safe and Safe Deposit type). 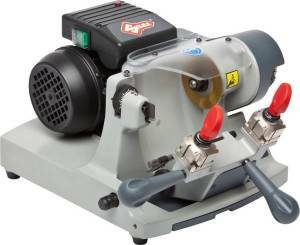 Manually operated, this is an ideal duplicator for cutting these specialty type keys. The Speed 046 is designed to duplicate flat type keys (Safe and Safe Deposit type) and includes features that any user will readily appreciate. The modern, open style, safety details and operational features make this model a choice model for store or shop and with the included mounting bracket; it is also an excellent choice for mobile use. Four sided, nickel plated jaws for clamping the majority of all edge cut/flat type keys. Smooth rotation by simply twisting into position. Slotted jaw surfaces accommodate tip stop bars and a rigid shoulder gauge design to allow for greater accuracy when loading and gauging keys. Electro-magnetic “main” safety switch with a separate cutter motor switch for easy access. Measures 15.75" Wide X 18.1" Deep X 9.8" High. Key machines are not returnable. If you have any questions, please ask before making your purchase. Trust the company who has been cutting keys for over 40 years. We use and sell only the brands we trust. 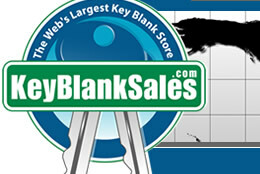 Nobody knows key blanks and key machines like us.